Malcolm Turnbull has received national security briefings and is consulting his colleagues about the design of his new cabinet, and has been sworn in as Australia’s 29th prime minister. Tony Abbott broke his silence just after midday on Tuesday to make his first comment since losing the top job. In a five minute statement to the press in which he took no questions, Mr Abbott promised not to leak or undermine from the backbench but complained about the changed nature of politics leading contributing to “sour, bitter character assassinations”. He said “poll driven panic” had caused a “revolving door prime ministership and the “febrile media” rewarded treachery. Mr Abbott’s handling of his defeat is in sharp contrast with former prime minister Julia Gillard who faced the cameras to congratulate Mr Rudd and wrote to the Governor-General on the same night she was ousted as prime minister. Shortly after Mr Abbott’s statement, Mr Turnbull visited the Governor-General in Yarralumla and was sworn in. 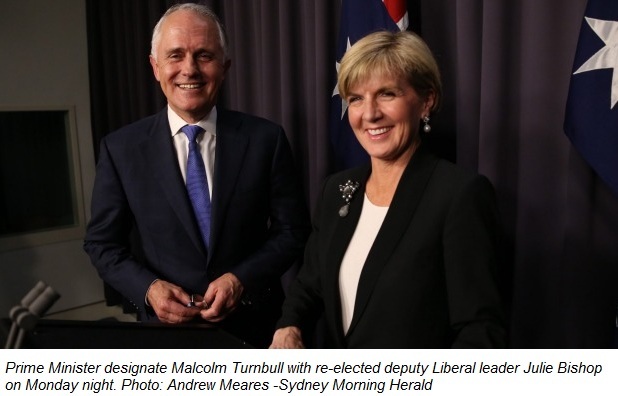 Julie Bishop overwhelmingly defeated a surprise challenge for her job of deputy from Kevin Andrews, who has signaled he wants to stay in cabinet, as part of the government’s healing process.